contact their neighborhood commission member or any member if you do not know which neighborhood you're in. WHAT IS THE BEAUTIFICATION COMMISSION? The PG Beautification & Shade Tree Commission has been very busy the past few years working on several projects to enhance and beautify our wonderful City. These projects range from planting trees to water conservation, from working on a City tree list to coordinating with the Parks department on park maintenance. Here are some details of our most recent projects. In 2013 the Mayor and the City Council asked the City Beautification Advisory Commission to compile a list of trees that would be a good choice for planting in Pleasant Grove. That list was completed and delivered to city staff members for their approval and revisions, then forwarded to the city council. It is available online as the PG City Tree Guide. Each year, the PG Beautification & Shade Tree Commission oversees the Annual Arbor Day Celebration. This event occurs the Saturday following Labor Day and consists of an opening ceremony, plantings of trees to improve a City property, and a recognition of PG City's involvement in the Tree City USA program. Each year, a Boy Scout Eagle candidate is identified to organize and coordinate this event with the oversight of the Commission. This event has been a center point for the tree planting efforts of PG City and has enhanced many properties, parks and green space. With our water needs continually increasing and our water resources dwindling, it has become imperative for PG City to do everything possible to conserve our water. To help with this effort, the PG Beautification & Shade Tree Commission has been busy creating a Water Conservation Awareness and Education Plan. In coordination with PG Public Works, the Commission is launching a three pronged approach of education, regulation, and monitoring to help maximize the conservation efforts. This plan consists of many options to help residents, businesses, churches, and schools within the City limits to become involved in helping conserve the precious resources of water. To learn more about this effort, please review our water conservation information. During the 2014 Strawberry Days celebrations, the PG Beautification & Shade Tree Commission held the first ever Strawberry Days Garden Tour. This tour included 11 amazing gardens and yards from within City boundaries being showcased for their beauty, uniqueness, or environmental awareness. This tour became such an instant hit that the Commission will be providing this event each year during our City celebration. If you know a yard that would be a great addition, please feel free to nominate it for the tour. Each month of the Summer (June, July, and August), the PG Beautification & Shade Tree Commission searches high and low throughout all eleven neighborhoods looking for amazing yards to showcase for the month. Yards that show amazing beauty, major improvements, or climate friendly plantings are determined. A sign is then put in the yard of choice and remains for the month. At the end of the month, the sign will be moved to the next Yard of the Month and a small gift is shared with the home owners. We highlight these winners each month in the City Newsletter. We are appreciative of all the hard work home owners do to help make our City and neighborhoods beautiful and inviting. You can see some of the previous winners on our Yard of The Month page. Along with Yard of The Month, the Commission searches for amazing Holiday decoration and light displays in each of our neighborhoods in early December. The displays awarded are those done by the homeowners showing creativity and beauty. The Commission awards a small gift and presents the Winners in the January City Newsletter. You can see some of the previous winners on our Holiday Lights page. Each year, the PG City Beautification & Shade Tree Commission partners with the Parks and Recreation Department on maintenance of the PG City Parks. The Parks department works diligently all summer long to maintain our wonderful parks and green spaces. During those months, the Commission reviews each park regularly and rates the park. At the end of the summer, the ratings are tallied and a winner is chosen. The Commission then hosts a "Thank You" dinner for all Parks personnel and their families to thank them for all their hard work through the summer. The winner is awards a small gift and certificate for their amazing efforts. We are so grateful for a fantastic Parks department and all that they do to make our City a awesome place to enjoy parks and recreation space. In our beautiful Pleasant Grove City, use of our water resources makes our city a beautiful, and inviting place to live, work, and play. The over use of this resource will cause us and our posterity serious problems in the near and far future. We must protect and conserve water whenever and wherever possible. What Does Being "Water Wise" Mean? Being "water wise" means conserving water as an individual, family, and community. By doing our part, we can make a big difference for our current and future community. Our water resource is a precious and limited commodity needed for now and our future. Small changes in our homes will make a big impact for us all! By reading though the water saving information on this site, as an individual or as a family, and implementing a few water saving techniques, we can each make a difference in our water usage. As you have heard in the news and can see by looking at our mountains, we are facing a very serious water shortfall again this year. This is due to many factors, which we cannot control. But we can control how much water we use. This is where we can all work together to improve our situation and protect our water resources. To help with this, we have provided several resources right here. Please visit this page often to see updates on our water totals and for updated information and resources. Boulevard/park strip trees – includes trees that are smaller in size and typically have a narrow or columnar growth habit. These features are important when planting in boulevards or park strips to reduce or eliminate a number of potential problems later as the tree matures. Poor selection of trees for a boulevard or park strip can results in things such as roots lifting sidewalks, branches interfering with driver visibility, branches inferring with power lines, unsightliness, other safety hazards, etc. Utility trees – includes smaller varieties of trees and includes some of the same trees as identified in the boulevard/park strip classification. The difference between the "utility" and "boulevard/park" strip classifications is this classification will include trees with smaller growth habits, but not necessarily a narrow or columnar growth pattern. Also, this classification includes both *deciduous and **coniferous varieties whereas the boulevard/park strip classification includes deciduous varieties only. Mid-sized trees – includes trees of both deciduous and coniferous varieties which typically require spacing between mature trees of 20 feet or more. Large-sized trees – includes trees of both deciduous and coniferous varieties which typically require spacing between mature trees of 35 feet or more. This publication is to be used as a guide when choosing a tree that will do well in the Pleasant Grove area. This is not an exhaustive list, and there are other trees no found in this guide, that may do well in Pleasant Grove. To select a tree not listed in this guide, here are some considerations to keep in mind. Look for trees that will do well in zone 5 or lower. The USDA has created a plant hardiness zone map that is divided into 10 regions that are defined by the average minimum winter temperatures. Our zone is 5b with a minimum temperature of -10° to -15°. Plants that are zoned higher (6-10) can't take temperatures lower than this. That being said, there are microclimates in your neighborhoods and even in your own yard that may not get as cold as a zone 5b. That is why you will see trees for zone 6 surviving here. If you do choose a tree that is zoned higher than a 5b, be prepared that it may not survive one of our extra cold winters. Look for trees that have a strong branch structure that are not prone to breakage in storms or heavy snow events. You can research whether or not a tree is prone to breakage online, through our local garden nurseries, or a good reference guide such as Dirr's "Manual of Woody Landscape Plants". Some trees that are more prone to breakage are: Flowering Pears, all Willow Trees, Purple Leaf Flowering Plums, Siberian Elms, Trees of Heaven, Cottonwood Trees and any tree with branches that form a sharp V shape at the crotch. The faster a tree grows, the weaker the branches will be. Good pruning practices can help lessen the risk of branch breakage. If you decide to choose a tree that is prone to branch breakage, only plant those varieties where they will not be a liability to people or property. Know your soils PH. The PH of soils is determined by a soil test. Most soils range between a PH of 5 (very acid) to 8 (very alkaline) with 7 being neutral. Pleasant Grove soils are quite alkaline and generally average between a PH of 6.5 to 8. Plants that need a more acidic soil, such as blueberries, azaleas, white pines, red oaks and certain maples, do not do well here. It is very difficult to change the PH of our soil because the water here is also alkaline. You can try to modify the PH of the soil by regularly adding compost, mulching with acidic mulch, such as pine needles, adding soil sulfur and fertilizing with acidic fertilizer. None of those methods will modify the soil's PH as deep as the trees roots will go and none are permanent fixes. They need to be repeated yearly to be effective for more shallowly rooted plants. You can research the PH needs of a plant through our local nurseries, online, or through good reference manuals. Know a plants sun, shade, nutrients and water requirements. Each plant has different needs. The sun is harsher in the Rocky Mountain States because of our altitude and lack of humidity. Plants that need full sun generally need to be put in a spot that gets 6 to 8 hours of full sun a day. Some plants that can deal with full sun on the east coast may need more shade in our area. Research the needs of each tree that you would like to plant to make sure you have the right spot for it. If a tree needs part shade, be sure to put it in the shade of another tree or building where it will get some sun during the day. If it needs full sun, be sure to not put it in an area where it will not get the sun it needs. Consider the growth habits of other trees and vegetation nearby that may have an impact on your tree in the future. Know the disease and insect pests for each tree you would like to plant and make sure that they are not an issue in our area. The local nurseries in our area are a good resource for this kind of research. Dirr's "Manual of Woody Landscape Plants"
Balled and burlapped trees- Balled and burlapped trees are priced by the width of the trunk about 4.5 feet above the ground. They are generally larger and more mature trees. They are dug out of the ground in the early spring and in the fall while they are dormant. When they are dug out of the ground, the roots are severed and then the root ball is bound in burlap to protect it. The larger the tree was when it was dug out of the ground, the more stunted it will be once it is replanted. Trees up to 2″ of diameter should do fine and will grow well. The diameter of a tree (tree caliper) is measured 4.5 feet up from the ground. The larger diameter trees will be stunted and may never catch up in growth to trees that were a smaller diameter when they were dug out of the ground. Potted Trees – Potted trees are priced by the size of the pot. They are usually started in a pot and then transplanted to bigger pots as they mature. The biggest issue to watch for with potted trees are circling roots. As the tree matures and grows in its pot, the roots can start to circle the pot. If they circle too much, especially at the top of the root ball, they can eventually strangle the tree and it will die. You can generally see the problem roots, if they exist, in the top few inches of soil. The larger the tree, the more important it is to choose from a reputable nursery. Smaller box stores can have good prices but the care of the tree while at those stores may not be optimal. Look for trees that have been well cared for while at the store or nursery. Drought or nutrient stressed trees may recover if they are a young tree but will probably struggle once planted if they are more mature. The USU has a good article on planting trees at http://forestry.usu.edu/htm/city-and-town/tree-planting/ten-tree-planting-rules. The following steps were taken from that article. Choose the right tree for your site using the steps we have outlined in the paragraphs above. Remove all labels, wires or ropes from the trees branches and trunk. You do not want them to girdle (dig into) the tree as it grows. Dig a hole that is 2 to 3 times the width of the root ball. 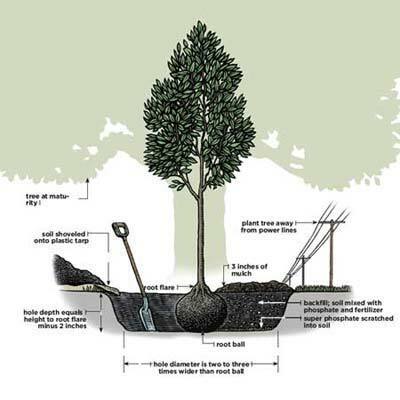 A balled and burlapped tree should be planted with the root collar just above the level of the soil. Do not bury the top of the root ball. A potted tree should be planted so the soil level in the pot is level with the soil it is planted in and should also not be planted too deeply. Be sure to identify and gently tease out any circling roots. If the circling roots are large and mature, leave them alone. Balled and burlapped trees need to have as much of the wire and burlap removed as possible. To protect the tree's root ball, place the tree in the hole with all the wire and burlap intact. Backfill just until the tree is stabilized and then remove as much of the wire and burlap as possible without breaking the root ball. It is ok to leave some wire and burlap at the bottom of the hole, it will naturally decompose. Backfill with native soil. Do not add fertilizer for at least the first year. If you need to backfill with soil amendment use 25% peat or compost to 75% native soil. Do not cut back the top portion of the tree. You can cut out dead branches, double leaders or branches that are interfering with other branches. Do not prune the tree the first year, and follow proper pruning practices thereafter. Allow some of the lower branches to remain on the tree to strengthen the trunk while it is young. You can slowly remove lower branches to the desired height over the span of 5 years. Keep a newly planted tree moist for the first few weeks after planting by watering it a couple of times a weeks. Water only when the top couple of inches of the soil are dry. Once established, water deeply and infrequently for the lifetime of the tree. One of the most important steps is to apply 2″ to 4″ of mulch around the tree up to 3 times the root ball diameter. As the tree grows, increase the circumference of the mulch. Do not pile the mulch around the trunk of the tree as that encourages root rot. Only wrap a trunk or stake a tree if necessary. The only times you should stake a tree is if it is in an area where there is a lot of wind, or if the crown of the tree is so much larger than the root ball that the tree won't stand up straight on its own. If you need to stake a tree, stake it loosely and only stake it for 1 to 2 years. Drought Tolerance – each tree is classified as to how waterwise it is with a designation of high, medium, or low. Native Plant – each tree has a "yes" or "no" to indicate whether it is a native Utah plant or not. Fall Color – each tree has description of the typical fall color the tree displays. Edible Fruit – each tree has a "yes" or "no" to indicate whether it has edible fruit or not. Growth Rate – each tree has a growth rate designation of "fast, medium, or slow". As the Pleasant Grove Beatification & Shade Tree Commission continues to look for ways to improve the beauty of our city, we have noticed so many beautiful yards, gardens, and residences. It so impressive how many of our great citizens work hard to keep our city beautiful and clean. We would like to recognize everyone and thank you all for your efforts. To help us do this, we have been awarding "Yard of The Month" and "Holiday Light" awards for several years. See below for details. Maybe we will spot your yard soon! What interests you about the Beauty of Pleasant Grove? Why would you like to serve on the Beautification and Shade Tree Commission? What areas of expertise could you bring to the Commission? What other community service experience have you had? When talking about water conservation, we can focus so much on yard water usage and forget that we run many, many gallons through each home each day. Small adjustments in how we use water in our homes can result in millions (yes, that is right…millions) of gallons of saved water each year. An average family of four can uses approximately 400 gallons of water per day. We can reduce this and minimize our waste by following a few simple practices. Here is an extensive list of ways your family could reduce water waste indoors. How many gallons can your family save? Even with all the snow, we all still need to conserve water where we can. PG City is launching a Water Conservation Education and Awareness campaign to help us all learn ways to conserve our precious water resources. Check out the Water Wise information and then make sure to Take the Water Wise Pledge! We are looking for some energetic, motivated folks who love our beautiful City and would love to participate in helping us improve our City. If you would like to be considered for a position on the Beautification and Shade Tree Commission, please submit your application today. Makes recommendations to the City Council for programs such as Arbor Day, cleanup and home beautification contests, etc. What is expected/required to be on the Commission? Have fun working on City beautification projects! Between our yards and our home life, we use a lot of water. A significant use of water in our neighborhoods is our lawns and gardens. We all enjoy beautiful yards, but we can minimize our water usage while still maintaining that beauty by adjusting and maximizing our sprinkler systems. Remember to always follow the city approved watering days for outside watering. This helps keep our water systems functioning at an acceptable level. Also, check out our section on improving your lawns for tips and tricks on how to increase your lawns water holding capabilities. The free sprinkler check is done by volunteers who have been trained on how to measure and calculate the best operating time and frequency of each of your lawn sprinkler zones. They will also identify any issues that you may need to have repairs or adjusted to improve efficiency. The check takes about 1 hour (depending on how many zones you have) and will produce a report for you to keep upon completion. Individual sprinkler checks and group checks can be requested. On sloping areas, water each zone for 10 minutes, cycle through all the zones and immediately water each zone for an additional 10 minutes. This will allow the water to penetrate more deeply into the soils. Each spring, rake in a thin layer (approximately ¼ to ½ inch) of fine organic mulch or compost. Water it is evenly and watch your lawn green up quickly. This compost gives a boost of nutrients to your lawn, but also increases the water holding capacity of the soils, especially on sloping areas. Keep your lawn cut at 2 and ½ inches to 3 inches each mowing. Mow every 5-7 days to keep the lawn healthy and happy. Use the recommended fertilizers at the recommended times to keep your lawn from being stressed. A stressed lawn takes more water to keep green. See your local nursery or home improvement store for recommendations. Check brown spots for insects, grubs, or incorrectly adjusted sprinkler heads. If your lawn in browning is spots, grab a hold of the browned area in one hand and slightly tug. If the grass comes right out with no roots, you probably have an insect problem. Check your local nursery, home improvement store or lawn care service to remedy this problem. More water will not fix this! Is your yard a smart yard? Similar to the concept of a smart car, a smart yard is designed to maximize the plant life, the soil type, the landscape and the environment to encourage growth, efficiency, and water usage. We are not sure who coined the phrase “smart yard”, but we love the concept. It is all about creating a yard that is in harmony with our native environment including plants, soils, and topography. We are putting the details together on our “smart yard” plan. You can view our draft Smart Yard Presentation or check out the Tennessee Smart Yard program (on which we are basing our program). Please check this page often as we are eagerly building our smart yard program and will put it here when it is complete for your reference. Utility trees – includes smaller varieties of trees and includes some of the same trees as identified in the boulevard/park strip classification. The difference between the “utility” and “boulevard/park” strip classifications is this classification will include trees with smaller growth habits, but not necessarily a narrow or columnar growth pattern. Also, this classification includes both *deciduous and **coniferous varieties whereas the boulevard/park strip classification includes deciduous varieties only. Look for trees that will do well in zone 5 or lower. The USDA has created a plant hardiness zone map that is divided into 10 regions that are defined by the average minimum winter temperatures. Our zone is 5b with a minimum temperature of -10° to -15°. Plants that are zoned higher (6-10) can’t take temperatures lower than this. That being said, there are microclimates in your neighborhoods and even in your own yard that may not get as cold as a zone 5b. That is why you will see trees for zone 6 surviving here. If you do choose a tree that is zoned higher than a 5b, be prepared that it may not survive one of our extra cold winters. Look for trees that have a strong branch structure that are not prone to breakage in storms or heavy snow events. You can research whether or not a tree is prone to breakage online, through our local garden nurseries, or a good reference guide such as Dirr’s “Manual of Woody Landscape Plants”. Some trees that are more prone to breakage are: Flowering Pears, all Willow Trees, Purple Leaf Flowering Plums, Siberian Elms, Trees of Heaven, Cottonwood Trees and any tree with branches that form a sharp V shape at the crotch. The faster a tree grows, the weaker the branches will be. Good pruning practices can help lessen the risk of branch breakage. If you decide to choose a tree that is prone to branch breakage, only plant those varieties where they will not be a liability to people or property. Know your soils PH. The PH of soils is determined by a soil test. Most soils range between a PH of 5 (very acid) to 8 (very alkaline) with 7 being neutral. Pleasant Grove soils are quite alkaline and generally average between a PH of 6.5 to 8. Plants that need a more acidic soil, such as blueberries, azaleas, white pines, red oaks and certain maples, do not do well here. It is very difficult to change the PH of our soil because the water here is also alkaline. You can try to modify the PH of the soil by regularly adding compost, mulching with acidic mulch, such as pine needles, adding soil sulfur and fertilizing with acidic fertilizer. None of those methods will modify the soil’s PH as deep as the trees roots will go and none are permanent fixes. They need to be repeated yearly to be effective for more shallowly rooted plants. You can research the PH needs of a plant through our local nurseries, online, or through good reference manuals. Choose the right tree for your site using the steps we have outlined the paragraphs above. Balled and burlapped trees need to have as much of the wire and burlap removed as possible. To protect the tree’s root ball, place the tree in the hole with all the wire and burlap intact. Backfill just until the tree is stabilized and then remove as much of the wire and burlap as possible without breaking the root ball. It is ok to leave some wire and burlap at the bottom of the hole, it will naturally decompose. Only wrap a trunk or stake a tree if necessary. The only times you should stake a tree is if it is in an area where there is a lot of wind, or if the crown of the tree is so much larger than the root ball that the tree won’t stand up straight on its own. If you need to stake a tree, stake it loosely and only stake it for 1 to 2 years. Native Plant – each tree has a “yes” or “no” to indicate whether it is a native Utah plant or not. Edible Fruit – each tree has a “yes” or “no” to indicate whether it has edible fruit or not. Growth Rate – each tree has a growth rate designation of “fast, medium, or slow”. Comments: The Columnar Hornbeam is a little more narrow than the common European variety. It starts branching at the base. It has a very formal appearance and does not require very much pruning. The golden fall color is spectacular. Comments: The Columnar Sergeant Cherry has an upright, narrow, growth habit. It has beautiful, white spring flowers. Comments: The Dawyck Purple Beech is a very narrow tree with an upright habit. It branches from the base and has beautiful, purple leaf color. This tree needs moisture, but can’t tolerate soil that stays too wet or is compacted. Comments: It is a shorter tree, so may block some views. The spring flowers are white and it does form fruit on the ends of the branches. The leaves are small and leathery and the bark is a lighter color. It is a hardy, beautiful tree that can stand many diverse conditions. Comments: This is the only pear I would consider for a boulevard tree. It is a little more disease resistant, and has stronger branches. The white flowers in the spring are beautiful but odiferous, and the fall color is spectacular. Comments: Zelkova trees are beautiful, disease-resistant trees with great fall color. Watch for weak, narrow branches while the tree is young, in this variety, to avoid breakage during storms. This is a very hardy and narrow tree. Comments: The Crimson Century Maple is a very narrow maple tree with great color. It can tolerate a wide variety of conditions but the trunk needs to be wrapped for protection from sun scald in the winter while the tree is young. Comments: This variety of Ginko is highly recommended as a street tree. It is a very hardy and narrow tree. Comments: Columnar Norway Maples are narrow, hardy trees. They have a yellow fall color. The trunks need protection from sun scald in the winter by wrapping them while they are young. Comments: The Lacebark Elm is a gorgeous tree with mottled bark. It is very tough and is adapted to our harsh conditions. It should not be confused with its cousin the Siberian Elm. It is a fast grower so the branches tend to be weak and prone to breakage. Comments: The European Larch tree is an interesting tree that turns brilliant yellow in the fall, then loses its leaves in the winter. It needs moist, well-drained soil to thrive. Comments: The Kentucky Coffee Tree is a beautiful tree that is disease and insect resistant. It is another tree well-adapted to our conditions. The large seed pods, found on the female tree, can be messy. Comments: The Honey Locust Tree is an overused but beautiful tree which is tolerant of many conditions. It is a fast growing tree that gives a light, dappled shade. Comments: The Common Hackberry is tolerant of wind, alkaline soil, salt and air pollution. The berries attract birds and the bark adds winter interest. Comments: The Sycamore Maple is tolerant of a wide variety of conditions including saline soils. It will struggle if the soil is not well drained. The seed pods turn red in the fall. Comments: The Tulip Poplar is a very large tree with beautiful yellow flowers in the summer. It prefers deep, moist soil. It is not tolerant of very wet or very dry soils. It is worth trying because of its unique leaves and beautiful flowers. Comments: The Bur Oak is a very large, beautiful oak tree. It has winged bark on its branches. Children love to collect and play with the acorns because of the fuzzy projections on the caps. This tree has deep roots that make it a better tree for lawns than most. It is highly drought tolerant and is well adapted to our conditions. Comments: The American Linden has larger leaves and is a bigger tree than any of the other Lindens. It is mostly tolerant to our conditions but is susceptible to several diseases. It is not tolerant of saline or heavy, wet soils. Comments: The horsechestnut has some of the most beautiful flowers found on any tree in our area. They are large and are either pink or white. It is a large tree that needs moist conditions, but does not tolerate heavy, wet soils. It is adapted to our alkaline soils. Comments: The London Plane tree is well adapted to our harsh conditions. It has lovely, green, mottled bark. It is related to the Sycamore tree and is distinguishable from it by the bark being green rather than tan. It is too large for most small properties. They are related to the Sycamore Tree and is susceptible to anthracnose. Trees that are infected with anthracnose will defoliate in the summer but will quickly re-grow the lost leaves. Yearly spraying in the spring may be necessary to protect the tree. Comments: The Sycamore tree is a very large, adaptable tree. It is too large for small properties and does tend to lift sidewalks and cause problems by lifting the asphalt in the streets. It is better when planted on large properties or in parks. Sycamore Trees are susceptible to anthracnose. Trees that are infected with anthracnose will defoliate in the summer but will quickly re-grow the lost leaves. Yearly spraying in the spring may be necessary to protect the tree. Comments: The Ohio Buckeye tree is related to the horsechestnut but is a smaller tree that has smaller leaves. It prefers some shade while it is younger to prevent leaf scorch in the summer. It needs to be planted in moist, well-drained soils. Comments: The Bald Cypress is a good tree for consistently moist areas. The roots develop buttresses so the tree can survive oxygen poor soils. It can be planted around ponds and in wetland areas. It can also tolerate drier conditions and needs a soil ph that is not too alkaline. It is a beautiful, large conifer that loses its needles during the winter. BYU has nice specimens surrounding the duck pond. Comments: The Ginko tree has no known pests or diseases and is very adaptable to our area. Plant the male variety to avoid messy fruit drop. The leaves have a beautiful, gold fall color and the nuts of the female tree are edible but have a foul odor. Comments: The Autumn Purple Ash is a moderately drought tolerant tree that can withstand the alkalinity of our soils. The fall color is a beautiful orange/purple. Watch for sun scald on the trunk in young trees and wrap them in the winter if they start to develop problems with splitting bark. Comments: The Austrian Pine is a large, hardy, drought-tolerant pine tree. It is one of the most adapted pine trees for our area. Comments: The Mountain Ash is a very drought tolerant tree with beautiful white flowers, great fall color and red fruit. It is subject to many diseases and pests including borers and fire blight. Comments: The Norway Maple is a dense tree with a round head that casts deep shade. It is adapted to our harsh conditions, has great fall and summer color and is easy to grow. It does tend to be over planted in Utah despite problems with aphids and sunscald on the trunk. Seedlings can become invasive in lawns. Comments: The Norway Spruce is larger tree that is drought tolerant and is well-adapted to our area. Deer do like to browse the growth tips of this tree in the spring. Comments: Pyramidal Hornbeams are hardy trees with a very formal appearance. They are moderately drought tolerant, and adapted to our harsh conditions. They have fabulous gold fall color. Comments: Tricolor Beech trees are fantastically beautiful trees that needs to be planted in an area protected from the sun. The multicolor leaves scald easily. These trees are not drought tolerant and do need slightly acidic soil for better leaf color. Comments: The Little Leaf Linden is an over planted tree in our area. It is not drought tolerant but is very hardy in Utah conditions. It has a nice pyramidal shape and highly fragrant flowers in the summer. The seeds can be messy. Comments: The Paper Birch tree has beautiful white, exfoliating bark and nice golden fall color. It needs a lot of moisture to look good. It is tolerant of our alkaline soil and is very salt tolerant. Comments: The Eastern Red Cedar is very drought tolerant and hardy in our area. It is a great tree to plant in tough conditions. Deer do tend to browse this tree when the winters are harsh. Comments: The European White Birch is a beautiful tree with white bark and a weeping habit. It needs more moisture than most trees but is hardy in our area. It tends to be affected by borer when stressed. Keeping the tree in moist, cooler conditions helps it avoid stress. Comments: The leaves on this pear tree are reddish in the spring and it has beautiful but mal odorous spring flowers. The fall color is spectacular. This tree is fast growing and the branches are prone to breakage. Comments: Mimosa trees are very pretty trees with fragrant, pink blooms that bloom all summer. They are marginally hardy in our area (zone 6) but there are several beautiful specimens in Pleasant Grove so they are worth trying. They have average drought tolerance but do not suffer damage from many pests. They do tend to suffer winter dieback especially in colder areas. The flowers continue throughout the summer and attract hummingbirds. Comments: The Bakari Blue Spruce is a smaller blue spruce with very blue foliage. It has moderate drought tolerance and does not suffer from many pests as long as it gets enough water. Comments: The Columnar Atlas Cedar is a slow growing tree that is quite beautiful. It does need good drainage and protection from harsh winters to do well. Comments: The Bosnian Pine is a slow growing, narrow pine tree that is well adapted to our area. It is quite drought tolerant and very beautiful. It has few pests. Comments: The Golden Rain Tree has very beautiful yellow flowers and unusual seed pods shaped like lanterns that can be messy in the fall. They are very drought and salt tolerant and do well in our area. One issue with Golden Rain Trees is weak branch patterns that make them susceptible to breakage in storms. Comments: This tree starts out green in the spring and changes to purple in the summer. The white flowers are very fragrant. It does have a habit of suckering extensively but can be grown as a single trunk tree with effort, or a multi trunk shrub. This tree grows well in areas that receive average water and have good drainage. The fruit is edible but is very astringent. The berries make wonderful jams or fruit leather. Eating them straight from the tree is not pleasant. Comments: The River Birch is a beautiful multi-trunked tree with reddish bark. It does best in areas with a lot of moisture and lower PH, but will survive in areas with less moisture and moderate alkalinity. Comments: The Japanese Tree Lilac is a beautiful, small, hardy tree. It has white flowers in the spring and glossy foliage. It is tolerant of salt and alkalinity. It does well in our area. Comments: The Incense Cedar is a beautiful, narrow tree. It is slow growing and shade tolerant. It is very drought tolerant once it gets established. The scaly leaves are very aromatic. There is a beautiful specimen growing by the BYU duck pond. Comments: The Amur Mackia is a little known tree here in Utah. It is a very slow growing but beautiful tree. It has white flowers in the summer when few other trees are in bloom and small brown seed pods in the autumn. It will tolerate the toughest conditions, including our alkaline soils. An added benefit is that the roots will fix nitrogen in the soil like legumes. Comments: The Autumn Brilliance Serviceberry is a tree that is native to Utah. It is shrub that has beautiful white flowers in the spring, fantastic fall color and edible fruit. It is very drought tolerant and does very well in our soils. Comments: As with most conifers, the branches on the Baby Blue Eyes Spruce need to start at ground level. This helps protect the trunk from sun scald. It is a tough, narrow, drought tolerant tree. This tree is prone to blowing over in wind storms if it is put in the lawn and watered shallowly and often, and not allowed to grow deep roots. It is not salt tolerant. Comments: The Big Tooth Maple has the best color of our Utah native trees. It is very drought tolerant and does very well in our area. Comments: The Camperdown Elm is a gorgeous, weeping tree. It is susceptible to Dutch Elm Disease, but is otherwise hardy. It needs moderate watering in the summer. Comments: There are many colors and varieties of crabapple. Look for persistent fruit to avoid the mess of fallen fruit. These trees are tolerant of many different soil conditions. Comments: The fruit of the Prairiefire Crabapple is persistent which means the fruit hangs on the tree until the birds eat it or it shrivels and falls off. It does not cause a mess. It has the darkest pink flower color of all the crabapples. Comments: This is one of the smallest crabapples. It has beautiful white flowers in the spring and persistent fruit. Comments: The Crimson Century Maple is a very narrow maple tree with great color in the summer. It can tolerate a wide variety of conditions but the trunk needs to be wrapped for protection from sun scald in the winter while the tree is young. Comments: This is a small, evergreen tree or shrub that is native to our mountains. Once established it does not need additional water. It has narrow waxy leaves and insignificant flowers. Comments: Redbud trees have beautiful spring flowers. They do need shelter from full sun while they get established. Shade from larger trees would be the best. A beautiful cultivar is Forest Pansy which has purple leaves in the spring. Comments: This is a native oak tree or shrub that is very drought tolerant once established. It naturally forms small thickets but can be grown as a small tree with some maintenance. Comments: The Kwanzan Cherry tree has very large, double, pink blooms in the spring. It is a shorter tree with a broad head. Comments: The Lavelle Hawthorn is a very attractive, hardy tree. It has white flowers in the spring and red fruit in the fall. The only drawback is the thorns. Comments: The Lavender Twist Redbud is a beautiful little weeping tree. It does need protection from hot drying winds and needs adequate moisture with soil that drains well. Comments: This cultivar of Austrian Pines is a new cultivar of an old favorite. It stays very short and compact and is hardy for our area. Comments: The Paperbark Maple tree has very beautiful, exfoliating bark. It is tolerant of alkaline soils and cold winters. Comments: The Smoke tree is actually a large shrub. It is very tough and can be pruned into a many trunked tree. The flowers form a smoky looking haze over the purple canopy. There is a cultivar with leaves that have a yellow tinge. Comments: The Snow Fountains Cherry is a small, beautiful, weeping cherry tree that has white flowers in the spring. Comments: The Tartarian Maple is a beautiful little shrub or tree that has red seed pods. It is more adapted to the alkaline soil of our area so it has less problems with iron deficiency than the Amur Maple. It has nice fall color. Comments: The Thornless Cockspur Hawthorn is a very beautiful, thornless Hawthorne tree. It has small leathery leaves and white flowers. Comments: The Utah juniper is another drought tolerant, Utah native. It is a smaller shrub that can take tough conditions. Comments: The Vanderwolf Pine tree is a small, very beautiful pine tree with flexible, elegant branches. It is more tolerant of our alkaline soils than other white pines because it is grafted on a root stock that is adapted to our soils. Comments: The Weeping Siberian Pea Shrub is drought tolerant and tough. It has thorns and yellow flowers in the spring. Comments: Zelkova trees are beautiful disease resistant trees with great fall color. This is a small, very hardy tree. Comments: This Zelkova cultivar is low and spreading with gorgeous fall color. It is very hardy and disease resistant. Comments: The Pinyon Pine tree is famous for the tasty pine nuts that can be gathered from this tree. It is a very drought hardy, tough and adaptable tree. It is worth planting in our area. Comments: This tree is a beautiful tree that is easily identifiable by the small white resin flecks on the needles. Each cluster of needles contains 5 needles. It is an exceptionally hardy tree and it is very drought tolerant and is native to our mountains. The only thing it cannot handle is heavy, wet soils. Some of the oldest living trees in the world are bristlecone pines. Every year during the months of June, July and August, your Pleasant Grove Beautification Commission members go out to each of our 11 neighborhoods looking for the "Yard of the Month"! The winning yards are based on several criteria. We look for a yard that is well maintained by homeowners who take pride in not only their yard, but also want their neighborhood to look good as well. We also look for a yard that may be considering ways to help conserve water. To recognize the wonderful yard and those who worked so hard to create it, we place a sign in their yard and award them a small gift. We also announce the winners in the following month's PG City newsletter and on the PG City website. As a Beautification Commission we love how festive Pleasant Grove looks during the holiday season and want to acknowledge all the efforts that are made by our citizens! During the first week of Dec., the Commission members go through each of our 11 neighborhoods [ looking for a festive house that deserves special recognition for the decorations, lights a festive nature. Our winning home is given a small gift and is mentioned in our January newsletter and on the PG City website.